Moving to a new house is a difficult time for any child, but it’s especially difficult if that child has a pair of sharpened fangs. Being the new kid is always rough but try being a vampire on top of it. That's what the little vampire, Vampirina, has to deal with! The thought of making new friends at a different school is terrifying even for a phantasma. 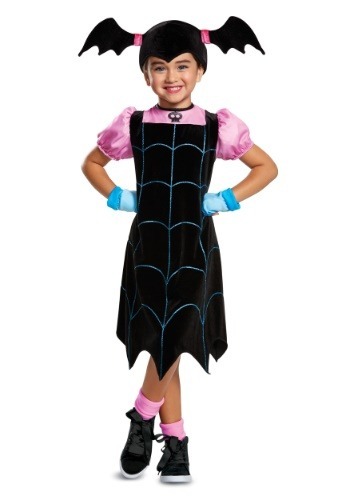 If your little girl sympathizes with the titular character from Disney's popular TV series, then this is the costume for her. She'll transform into the one and only Vee Hauntley with the help of an officially licensed Disney Vampirina classic girl's costume. Experiencing what it's like to have batwing pigtails and testing out sleeping upside down will be supernaturally surreal. She's in store for a lot of costume-fun this Halloween and for many dress-up parties to come! The pullover glitter spider-web dress with tattered hemline has an attached satin-like shirt attached underneath, creating one simple garment that looks like two separate pieces. The attached undershirt feels satin-like with puffy sleeves. A pair of blue gloves is included with the character dress as well as her most notable trait, a batwing pigtail headpiece to complete the cartoonish disguise. The transformation into Vampirina is perfected with a few key accessories that your daughter will want to get her hands on anyway. You're in store for plenty of performances if you add the MP3 microphone to the order. There's also a Vampirina sing-along boombox she can easily carry along for impromptu performances while still toting a trick-or-treat bag for candy too. Finally, you can't forget a Spookylele. We have one that really plays music. Strap it around her before she heads out for some Halloween fun.